One in two Canadians believes there is a high or moderate threat of eco-terrorism on energy infrastructure in Canada. 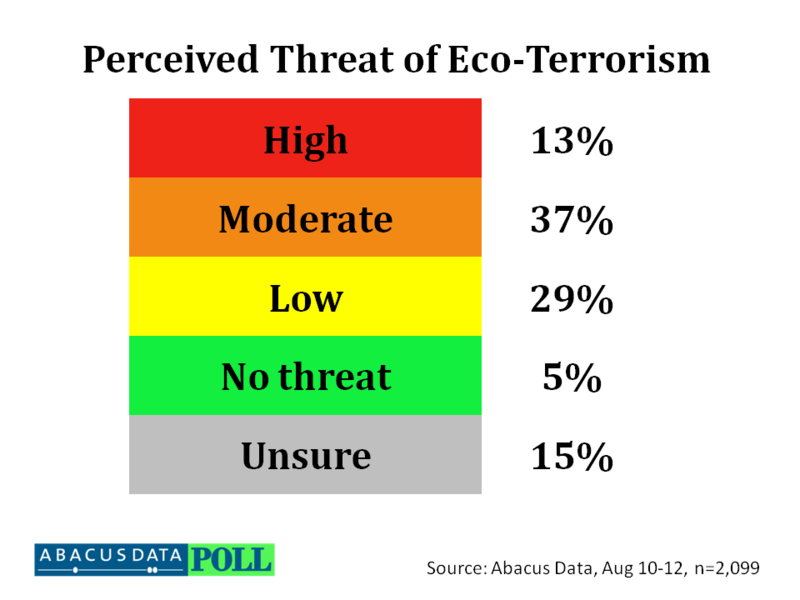 A new survey from Abacus Data commissioned by the Sun News Network finds one in two Canadians (50%) believe that the threat of eco-terrorism on Canadian energy infrastructure is either a high (13%) or moderate (37%). A majority of Canadians surveyed support having armed guards at all oil and gas refineries, having armed guards patrol oil and gas pipelines, and having the RCMP and CSIS monitor environmental groups to help reduce the chances of eco-terrorism in Canada. Moreover, 49% of respondents either strongly (15%) or somewhat agreed (35%) that environmental groups are to blame for encouraging illegal behaviour such as blocking the construction of pipelines or violence against construction workers. Twenty-nine percent either strongly (12%) or somewhat disagreed while 22% were unsure. We asked Canadians whether they would support or oppose certain measures to help reduce the chances of eco-terrorism in Canada. Six in ten Canadians (60%) surveyed said they would support having the RCMP and CSIS monitor environmental groups while 20% opposed such measures. This was the most widely accepted measure in preventing eco-terrorism to Canadian energy infrastructure. Support was highest among Conservative voters (81%), seniors (70%) and Albertans (69%). Opposition to this was highest among British Columbians (28%), younger Canadians (29%), and Liberal Party voters (32%). A majority of Canadians also supported having armed guards at all major oil and gas refineries (52%), at all major power plants (53%) and monitoring oil and gas pipelines (55%). Finally, respondents were asked whether they agreed or disagreed that environmental groups are to blame for encouraging illegal behaviour such as blocking the construction of pipelines or violence against construction works. Overall, one in two respondents (49%) agreed with the statement while 29% disagreed. Twenty-two percent were unsure. A large majority of Conservative Party voters (75%) and majorities of Albertans (65%), seniors (60%), and men (54%) agreed that environmental groups are to blame for illegal behaviour against pipeline construction. Attitudes among NDP and Liberal Party supporters was more mixed with 45% of Liberals agreeing and 36% of NDP voters agreeing with the statement. Although few Canadians are very concerned about the threat of eco-terrorism, a majority believe the threat to be either high or moderate in Canada. Nonetheless, majorities of respondents support measures to prevent attacks on energy infrastructure from occurring including the monitoring environmental groups. What is most interesting about the issue of eco-terrorism is the depth of partisanship that seems to be driving opinion. Conservative Party supporters are much more likely to believe there is a threat, are more likely to support preventative measure, and are much more likely to blame environmental groups than other party supporters. It is clear that the Harper government’s framing on issues around energy infrastructure security and “radical environmental groups” has been successful in dividing the population. While Canadians care about environmental safety around the development and transportation of energy, they also care about security Canada’s energy infrastructure and preventing attacks by radical environmental activists. The survey was conducted online with 2,099 respondents in English and French using an internet survey platform. A random sample of panelists was invited to participate in the survey from a larger internet representative panel of over 150,000 Canadians. 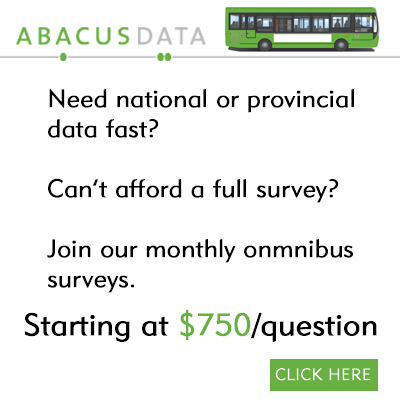 The survey was completed from August 10-12, 2012. An over sample of was conducted in British Columbia (n=793) and Ontario (n=502). The data was statistically weighted by age, gender, region, and education level according to census data. Since the online survey was not a random, probability based sample, a margin of error could not be calculated. The margin of error for a survey of 2,099 respondents using a probability sample is +/- 2.2%, 19 times out of 20. We’ve replicated this scale in our survey by asking respondents a series of 10 questionnaire items that are statistically weighted according to their correlations with the scale (Noelle-Nuemann, 1985). Influentials are opinion leaders who are active communicators on issues that span multiple subject areas. 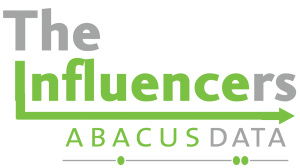 In the Abacus Data version of the measure, Influencers are also identified by their media consumption habits. By testing respondents’ self-perceived levels of personal influence we can identify this group within the Canadian population. As tested by the Allensbach Institut the Strength of Personality Scale is shown to validly reflect a measure of real communication flow and level of influence across samples (Weimann,1991).